In “190 Days: A Teacher’s Tale” by A.E. Walker, we meet high school teacher, Emily Dow. Emily has to deal with the usual frustrations of being involved in the education system. She has a principal that should have retired way before he was in his 80s, as most days he isn’t even quite sure what high school he is at. She has frustrating new software that is supposed to make things easier, yet it doesn’t. And she has students with some very serious behavioral issues. While she is trying to juggle everything on her plate, her evil ex-brother-in-law is murdered and it appears that her sister-in-law did it. Emily is certain that her sister-in-law does not have the mental capability of committing such a crime, however, she was seen threatening him, and she violated a restraining order when she was found in the vicinity of his body. Things just aren’t adding up. Deciding to investigate the case, Emily quickly learns that there are a lot of people who could have wanted him dead. She knew this before, but now she has concrete reasons for why there should be other suspects. The ex-brother-in-law was capable of performing the vilest of acts, and Emily has to get the truth out in the open so that the police will start looking beyond the accused. Along the way, she finds her tires flattened and threatening notes. Determined not to back down, she stays on the case until the very end. As an educator in higher education, I was able to relate to Emily’s daily frustrations on the job. From having to deal with educational software that doesn’t do what it is supposed to do, to having a retired administrator brought back to cover until the college found a president, I have seen it all! In my case, that temporary president spent 45 minutes talking at a graduation ceremony about how the college was making improvements, including redoing the parking lot! I felt so bad for the grads, but happy that they were moving on to better things. Anyway, relating to the protagonist’s life really helped connect me to her story. The mystery was an adventure because there were so many layers involved with this case. It was like Emily peeling the layers on an onion to get to the truth at the center. The final outcome of what had really happened was complex and heartrending. 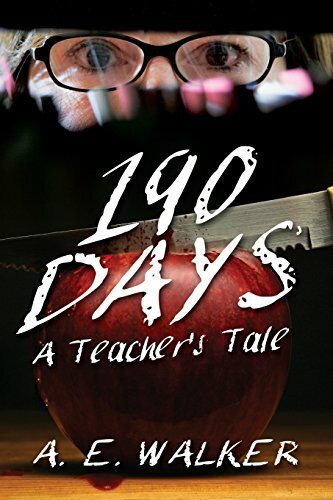 As a whole, “190 Days: A Teacher’s Tale” by A.E. Walker is an excellent, well-written novel. I highly recommend it, especially to educators.